The road we are on in this journey of Rojo's is such a bumpy one. We seem to always be encountering a fork in the road after a straight path, filled with potholes. Road construction ahead. Detour here. But deterring from a familiar path is healing and can lead to new adventures, ideas, and challenges. It is nice to have a routine. Our week (that is Roa's week) is filled with activities- OT, PT, Speech, Conductive Education, Aquatics, School, Courage Riders.... We keep him busy. We keep him working. We pray for changes, goals reached, milestones met. But after this last five days of time, with Pati, experiencing our first Anat Baniel Method program, we are questioning our fast pace. I want to be a skeptic of the ABM approach. I have read, googled, chatted with families, searching for a critic. Someone out there tell me it is bogus! But, I can not find that critic. I find parents who complain of the cost.... I hear ya, Sista! I find parents who have had sessions with Anat herself who claim that she is not a very nice person. I find people who say it is hard to find practioners near their hometown. I find some who tell of how difficult it is to give up hope in the traditional therapy methods and those therapist that have become such a part of your team/family and focus completely on ABM. But, not a critic. No negatives about the therapy. I read Anat's book. I've watched her DVDs and Youtube clips. I wish I would have had the time and energy to blog each day after Roa's sessions with Pati. However, it was exhausting, for all of us. Thank goodness I had the help of my sister, Vickie, and Bryan's Dad, Al to help manage both boys while Roa was in sessions- 30 minutes in a car. 30-50 minutes in session. 30 minutes in a car. Repeated twice a day. Since I didn't get a chance to blog each day. I will have to summarize for you about our learning through these intense days. 1) Credit. We realized we do not give Roa enough credit for the smart boy that he is. 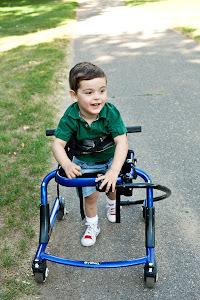 We need to allow him to physically help with tasks such as getting in and out of his carseat or wheelchair or getting dressed, even in tiny ways. lift your arm, sit forward, look down. He can be a willing active participant in these daily tasks if we only ask him to be. Talk him through the task. 2) Slow. We need to ask of him.... and wait. Give him a chance to process the movement, sound to make, or next step before we jump to help him, speak for him, or move him ourselves. S L O W way down...in his movements when we do move him ourselves. SLOW our life down to benefit him. 3) Break the Routine. We do a nice of job of varying activities we do within our therapeutic routine. But in order to stimulate new brain connections and patterns of motor control, we need to break from the routine and bring about some unexpected feedback to his body and thus his brain. 4) Support. Part of Roa's developmental delay is his big need to feel secure in space. His body awareness is poor so exploring movement is scary. While on his back, trying to sit, attempting to roll, etc, he will startle and feels insecure about what is happening to his body. We need to give him additonal little supports- a pillow under his top leg or arm in side-lying, a blanket around his waist when sitting up, or under his knees. Until he feels more secure in space... then we can slowly remove the support. Along with that, when he is reaching to grasp, we need to give him a firm hand hold in his upper arm or shoulder. Wow, can he manipulate when supported in this way! The ABM method is so quiet, and gentle. I watched Pati work, manipulating Roa's spine, pelvis, hips in awe. I was a quiet observer.. but inside I was shouting TELL ME WHAT YOU ARE DOING SO I CAN DO IT TOO! I watched and learned a little. I hunger for more! Why, you ask? What is it about this method? Well for one, Roa had such mixed emotions. He smiled, he cried, he tantrumed, he laughed, he looked scared, he looked incredibly peaceful. Overall, he was engaged! With all the therapies we do, I sometimes see that zoned out, who's-gonna-"play with me"-now look. Not with ABM. He was IN it. Secondly, Roa is now a bit calmer. He seems more comfortible on the floor. I have walked out of a room leaving him on his back and return to find him on his tummy. I also notice him sitting with better, stronger posture. We don't always put his wheelchair's chest vest on... he just doesn't seem to need it all the time. And, Roa attempted to pull to stand! He was pulling on his brother (not such a sturdy surface) but it was an attempt! Tiny earthquakes.... they mean everything to us! And so, we are discussing Roa's current schedule. We are looking at the possiblity of slowing down for the summer. Giving his body a chance to explore and giving this ABM deal a chance to move him forward on this summer path of potholes, speedbumps and construction. 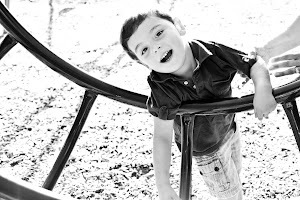 HERE IS AN AMAZING VIDEO TAKEN AT FUNCTIONAL KIDS WITH JULIE! Tomorrow begins a busy few weeks for Roa. After a fairly slower paced start to June, we are off and running beginning with a White Bear Lake community summer preschool program. Roa will be attending this two-day week class with Maile,his PCA. She willhelp him be involved with all elements of the program. Tuesday, begins his six week session of Courage riders hippo therapy. He is pumped for that! we will carry on with speech and OT at functional Kids on Mondays and Thursdays and also had a therapy pool session at Special Children's Center in Hudson on Wednesdays. Conductive Ed. is Tuesday and Thursdays. Fridays is mom day, Courage swim time and PT with Lauren. This Thursday, all other methods are on hold as we devote 110 percent to Anat Baniel Method. Two sessions per day, 45 minutes per session, for 5 days. We will live and breathe ABM. I have been doing my part reading Anat's book, watching her DVDs, and youtube clips. We pray for the tiny miracles to occur within Roa's brain that trigger motor control that so many children experience with the intense brain based method. I'm posting a couple links to show you more of what this practice is about. Thank you to those of you who have donated to Roa's therapy fund. It will help emensely as we begin another busy summer of Early intervention. Roa has that way about him. Roa draws people in. Last weekend we ventured on a family outing to Forest Lake, MN. This quaint, little town has a lakeside park with playground, boat dock, and sandy beach. It was the perfect Memorial Day setting. Like always, we were well-equipped with wheelchair, stroller, and gait trainer in tow. Never know what we will need. Of course, when we let Roa decide his wheels-of-choice, he chooses the gait trainer. His favorite mode of independence. So we set out, Gunnar trucking it across the park lawn towards the ever-favorite swing set, Mom scurrying behind, Roa giggling and taking off with the awkward, straigth-legged gait of limbs just waking, and Dad calmly steering the GT. Same basic scenario that we are used too. But to others, we are a sight to be seen. As I shuffle after Gunnar, listening to the yelling, cooing, laughing of Rojo behind, I realize it is necessary to put up the shield of tolerance. We, humans, fear the unknown. We can't help but gaze longly at differences. It is one of those moments when I knew to instantly activate the shield and continue being Mom-Ignore the stares, the stop-in-your-tracks-reactions, the What is that? questions of children to their Hushing parents. That is just a day in the life we lead. As is also typical, it is Bryan's turn to be down. It is oddly comforting to know that God has granted us the ability to off-set each other. When Mom is sad, Dad is optimistic. When Dad feels anger, Mom is calm. When Mom doesn't know if she can leave the house that day, Dad encourages and steer our ship forward. It is one of God's graces, to say the least. So Bryan is with Roa, walking down the dock, across the beach, into the lakes sandy edge. Even though he would like to just blend in and be another dad with a curious little boy, that is impossible. They just stand out. He is questioned and pointed at. As I chase Gunnar around the park gazebo, I watch a a small circle is formed around Roa and Dad. Curious, I urge Gunnar forward towards them. Roa in his gait trainer, Bryan crouched beside him. To his left, a large man with Mr. Clean-shaven head, dark beard, and arms full of tattoos approaches. Beside the tough biker is his significant other- long brown hair, shades and tank top. On the other side of Roa is the Lady Leader, arms filled with roses. By her side, her teenage daughter, shy and sweet. I refer to her as the Lady Leader because she is leading them in prayer. This small group of worshippers is surrounding my son with something much stronger than my shield of tolerance. It is the shield of faith. Roa glances up at me with the side wise grin of "Gosh Mom, I can't help it",as Gunnar and I approach. Bryan gives me a sad, peaceful look that says, "Yep, this is what I needed today". I can only look on in wordless awe, as the Leader Lady hands me a rose and says, "Bless you". You see, God has a way of placing unexpected angels in unlikely places to keep you going forth in this battle against CP. Our day of swings, walks, and picnics was replaced by tattoos, roses, and prayers. But we are fine with that.